Ever wonder what the temperature is inside those hot air poppers? Me too. A month ago, I had a craving for popcorn and found a popper for a $1 at the Volunteers of America on Indianola. Having popped a bunch of corn, I wanted to probe further. I've used appliances like this to roast coffee beans successfully and knew they got pretty damn hot. But, how hot? Armed with my trusty USB datalogger, I tossed a thermocouple in with the popcorn seeds and let it rip. I didn't anticipate the probe actually getting in the way of the popped corn, but no biggie. I was able to obtain the temperature of the beginning of popping before the popper nearly ignited. 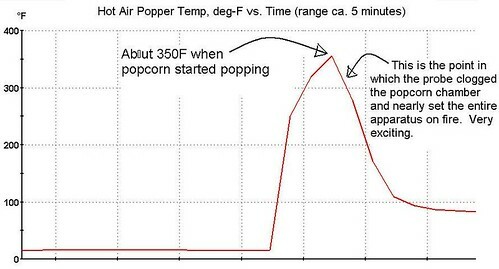 After the first few kernels popped at about 350°F, the chamber got jammed with popcorn and the edibility of the batch was shot (edibility?). It kept popping and jammed in the chamber. I don't know how the batch fit; kind of like an entire bag of cheese puffs fitting into a drunk frat boy's mouth. After chiseling the out the popped corn and letting the unit cool, I did another batch so I could have a snack while processing the data. It was good. What will I do with this valuable nugget of data heretofore known only by senior scientists in the food science industry? Stay tuned (he said in a crafty voice).